Dr. Ryder is a native of Dallas, received her undergraduate degree from Vanderbilt University, Nashville, Tennessee in 1995 and her medical degree from University of Texas Health Science Center San Antonio, Texas 1999. She then completed her residency in Obstetrics and Gynecology at Baylor University Medical Center, Dallas, TX. 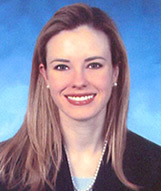 Dr. Ryder then joined Northlake OB/Gyn in 2003 and is a partner of the group. Dr. Ryder is board certified in obstetrics and gynecology and is a member of the Texas Medical Association, and a Fellow of the American College of Obstetrics and Gynecology. Dr. Ryder is married to Charles and they have twins, Daly and Kate. As a physician and mother of young twins, she does not have much spare time. As time permits, Dr. Ryder enjoys traveling, working out and most of all, relaxing on a beautiful beach.